After the release of his widely praised solo debut Where You Go I Go Too in 2008 and his collaborative album with Prins Thomas II the same year, Norway’s maestro of nu-disco Lindstrøm returns with a new retro-fururistic masterpiece: Real Life is No Cool (Feedelity, 2009). This time he has teamed up with sultry vocalist Christabelle to bring us an edgy pop album of structured chaos, hypnotic beats and mesmerizing vocals. Christabelle (also known as Solale to Lindstrøm followers) has been working on and off with Lindstrøm since 2001. Their relationship began when she immediately fell in love with his sound after hearing her brother Dennis (a friend of Lindstrøm) play some of his tracks at home. 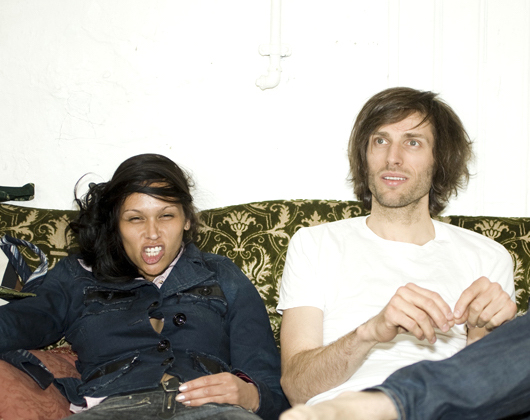 Upon listening, she proceeded to lay down vocals on some of his tracks, and her brother then delivered them to Lindstrøm. His first impression was, “Wow! This sounds totally fresh, wild and quirky”. Lindstrom & Christabelle’s sticky electro-disco anthem “Baby Can’t Stop” received the remix treatment, turning it into a real dancefloor filler. Aeroplane‘s sublime production gives the song an otherworldly beauty that is hard to convey through words. Listen and enjoy!